You have most likely landed on this page looking for an affordable online college degree. To help facilitate your search, we have put together this list of top colleges offering cheap online degrees by degree level–from Associates to Masters. 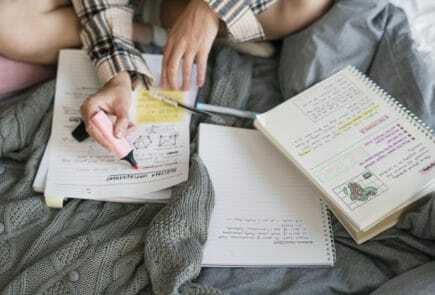 Through affordable online programs, you are given the opportunity to achieve success on your higher education path in the comfort of your own home or apartment, Starbucks or McDonald’s or wherever you may find yourself connected. Online degrees off asynchronous courses, meaning that you can listen to or watch lectures, complete assignments or participate in class discussions largely on the schedule you decide. Cheap online degrees offer students the same level of education and career advancement as expensive degrees. Schools considered for the best affordable online colleges are defined as public or private non-profit/not-for-profit colleges and universities. Schools must have strong, reputable online degree offerings. Schools must also have a received at least one national ranking from a reputable source (e.g. US News and World Report). 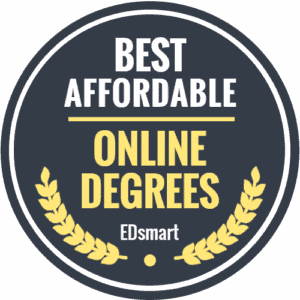 To rank the cheapest online college degree programs, EDsmart looked at a variety of statistics from the National Center for Education Statistics’ Integrated Postsecondary Education Data System (IPEDS). For the Best Cheapest Online Associate’s Degrees, we looked at the average net price and retention rank. For the Best Cheapest Online Bachelor’s Degrees, we calculated rankings according to the average net price, graduation and retention rates. For the Cheapest Online Master’s Degrees, we calculated rankings according to average net price, graduation and retention rates. Each data point was weighted equally. The average net price reflects the most realistic price a student should expect to pay and represents affordability in this ranking. Graduation and retention rates are an indication of the academic quality of a given school. After data points were crunched, each school was given a rank for each data point and an overall final score based on a curve so that the best cheap online college (ranked #1) earned a maximum 100 points. In case of ties, the college or degree with the lowest net price was selected as the winner of the tie. Amarillo College shines brightly in the 2019 edition of most affordable online colleges rankings. Ranking overall at #1 with the highest retention rate and second lowest net price on our list. Classes are offered as traditional, online, hybrid, or enhanced online courses. Amarillo College, based in Texas, offers 8 online associate’s degrees and 6 online certificates. Amarillo’s online associate degrees include Business Administration, Business Management, Criminal Justice, Education – Secondary, General Studies – Education, Mortuary Science, and Radiation Therapy. The most popular program at Amarillo College, according to The National Student Clearinghouse Research Center, is nursing and health sciences. Niche.com gives Amarillo an Overall Niche Grade of “B” in 2019. Amarillo College offers the best affordable online associate degrees in Texas and in the nation. Clovis Community College serves almost 12,000 students in the state of New Mexico. This institution is accredited by the Higher Learning Commission. Eight different associate’s degree programs are offered online to allow students to have more flexibility. Those programs include Behavioral Science, Business Administration, Computer Information Systems, Criminal Justice, Early Childhood Education, General Studies, Legal Assistant Studies (Paralegal), and Liberal Arts. Clovis Community College offers one of the cheapest online degrees in New Mexico. Lone Star College provides educational services to around 20,000 students in the Houston area. It received its accreditation from the Southern Association of Colleges and Schools Commission on Colleges. The college offers over 30 different online degree programs for students seeking an associate’s degree. Students can choose from degrees in Accounting, Administrative Services, Business Administration, Computer Programming, and Teaching. Niche ranks Lone Star College #6 in Best Community Colleges in the state of Texas. Arkansas Northeastern College provides students with affordable online college degrees. It is accredited by the Higher Learning Commission. Students can choose to complete an associate’s degree online in the Arts, General Studies, Criminal Justice, Business, Criminology, and Early Childhood Education. Two years in a row, ANC has been ranked as #1 in Arkansas and #15 in the United States for Most Affordable Associate Degrees. It has also been ranked as having the #1 in Arkansas and #6 in the United States Best Value Associate’s Degree in Criminal Justice. Two years in a row, ANC was ranked #19 in in the nation for Best Online Education and Teaching Degrees. San Juan College provides cheap online degrees in several popular fields. It was accredited by the Higher Learning Commission. San Juan College offers associate’s degree programs in Business Administration, Liberal Arts, Psychology, Occupational Safety, Health Information Technology, Physical Therapist Assistant, and Veterinary Technology. A degree from SJC is an affordable online degree, especially for New Mexico residents. SJC ranks firth in enrollment in the state of New Mexico among all two-year colleges. On Niche, San Juan College ranks 128 out of 868 community colleges in the United States. Southeast Community College offers students a way to earn an associate’s degree at a cheap online college. Southeast Community College earned its accreditation from the Higher Learning Commission. Various programs can be completed online at SCC, including Business Administration, Computer Information Technology, Dental Assisting, Early Childhood Education, Fire and Emergency Services Management, Geographic Information Systems Technician, Human Services, Long Term Care Administration, Office Professional, Polysomnographic Technology, Respiratory Care, and Surgical Technology. On Niche, Southeast Community College ranks as #26 on the list of Best Community Colleges in America. Hutchinson Community College, located in Kansas, offers over 250 different courses online. Students can complete associate’s degrees in the Arts or Science. Degree programs available through online study include General Studies (both A.S. and A.A.), Accounting, Business, Early Childhood Education, Health Information Management, and Paralegal Studies. HCC received its accreditation from the Higher Learning Commission. On Niche, Hutchinson Community College ranks #2 in Best Community Colleges in Kansas. It also ranks 34 out of 868 Community Colleges in the United States. Western Iowa Tech Community College was ranked one of the Best Online Schools in Iowa in 2016. Students can choose from several affordable online degrees, including Accounting, Accounting Specialist, Agribusiness Technology, Agriculture, Agriculture Management, Child Development – Infant/Toddler, Childhood Development – Preschool, Coaching, Cost Accounting, Entrepreneurship Concepts, Financial Services, Health Information Technology, Human Resources, Human Resources Management, Office Assistant, Payroll Clerk, Tax Preparer, and Technical Business Management. On Niche, Western Iowa Tech Community College ranks #2 on the list of Best Community Colleges in Iowa and 46 out of 868 on the list of Best Community Colleges in America. Cowley Community College is one option for a cheap online degree in Kansas. This institution received accreditation from the Higher Learning Commission. A wide array of associate’s degree programs are offered through distance learning at CCC, including Accounting, Agribusiness, Applied Technologies, Business Administration, Computer Information Science, Computer Science, Creative Writing, Education, English, Entrepreneurship & Business Leadership, Health Services Management, History, Hotel & Restaurant Management, Instructional Technology & Design, Pre-Law, Leadership, Liberal Arts, Medical Coding, Medical Transcription, Paraprofessional Educator, Political Science, Psychology, Religion, Social Work, Sociology, and Sports Management. It is ranked #12 in Kansas for best and affordable community colleges. Barton County Community College is one of the cheapest online colleges in the state of Kansas. Barton County Community College offers several associate’s degree options, including Associate in Arts, Associate in Science, Associate in General Studies, and Associate in Applied Science. Students can choose from subjects like History and Biology, or a vocational topic, such as Physical Therapy or Emergency Management. It received its accreditation from the Higher Learning Commission. Most of its programs are offered online, as well as in-person, which means students have great flexibility to complete their chosen degree. Barton County Community College ranks #4 on the list of Best Online Community Colleges prepared by Best Value Schools. Lake Region State College boasts online programs that make higher education convenient, affordable, and attainable. This institution received accreditation from the Higher Learning Commission. Degree programs include Associate in Arts and Associate in Science, as well as vocational programs in Business Administration, Early Childhood Education, Fitness Trainer Technician, Law Enforcement, and Speech-Language Pathology Paraprofessional. Out of 868 of the Best Community Colleges in America, Lake Region State College ranks #134. It was also ranked #20 in a 2018 report by the Chronicle of Higher Education on best completion rates among two-year colleges. North Hennepin Community College offers several options for affordable online degrees. It received accreditation from the Higher Learning Commission and is also a part of the Minnesota State College and University system. Online associate’s degree options include Liberal Arts, Accounting, Accounting Technology, Business Computer Systems and Management, Business Administration, Computer Science, Entrepreneurship, Finance Management, and Marketing. It was ranked #2 on a 2019 list of Best Community Colleges in Minnesota on Niche. And in 2018, WalletHub put North Hennepin Community College #10 out of 700 community colleges across the United States. Florida International University helps students receive bachelor’s degrees in many programs online. This institution was accredited by the Southern Association of Colleges and Schools Commission on Colleges (SACSCOC). A wide selection of cheap online degrees is offered through Florida International University, including programs in the areas of Business, Criminal Justice, Communication, Engineering, Education, Hospitality, Languages, International and Public Affairs, Humanities, and Social Sciences. Several programs at FIU rank in the top 100 in the U.S. News & World Report, including Business, Criminal Justice, and Education. On Niche, Florida International University ranks #5 in Top Public Universities in the state of Florida and as the second-best value college in the Miami area. University of Central Florida lets students pick over 20 different online bachelor’s degree programs. It received accreditation from the Southern Association of Colleges and Schools Commission on Colleges (SACSCOC). Examples of bachelor’s degrees available for students to obtain online, include Anthropology, Criminal Justice, English, Health Services Administration, History, Legal Studies, Nursing, Psychology, Communication and Conflict, and Technical Education and Industry Training. The most popular online programs are Psychology, Nursing, Health Services Administration, and Criminal Justice. The U.S. News & World Report places UCF at #15 on a list of the Best Online Bachelor’s Programs in the Nation. American Public University provides students over 45 online bachelor’s degree programs. This institution was accredited by the Higher Learning Commission. Among the affordable online degrees available at American Public University are Accounting, Criminal Justice, Entrepreneurship, Healthcare Administration, Marketing, Nursing, Management, Space Studies, Information Technology, Transportation and Logistics Management, International Relations, Military History, and Supply Chain Management. In 2017, American Public University was recognized as #5 “Best Bang for the Buck” on Washington Monthly Magazine’s annual college rankings. The University of North Florida offers several unique and affordable online degree programs for students. It was accredited by the Southern Association of Colleges and Schools Commission on Colleges (SACSCOC). One bachelor’s program is designed for Registered Nurses (RNs) to work towards a Bachelor of Science in Nursing (BSN). The other program aids current American Sign Language K-12 teachers to complete additional courses to obtain ASL Endorsement. The U.S. News College Rankings lists the University of North Florida as #58 in the entire United States for Best Value Schools and #37 in Best Online Bachelor’s Programs. Texas Tech University (TIE) provides students with an option for cheap online college, along with interesting bachelor’s programs. Accreditation for this institution is provided by the Southern Association of Colleges and Schools Commission on Colleges (SACSCOC). Bachelor’s programs offered online, include Applied Leadership, Human Sciences, Restaurant, Hotel, and Institutional Management, Communication Studies, University Studies, Architecture, Early Child Care, Plant and Soil Science, Wind Energy, Digital Media and Professional Communication, and Biology. TTU ranks #26 on the U.S. News Best College Ranking of Best Online Bachelor’s Programs and #50 in Best Online Bachelor’s Programs for Veterans. Sam Houston State University offers top-ranked degree programs online to offer prospective students flexibility in their daily lives. This institution received accreditation from the Higher Learning Commission of the North Central Association of Colleges and Schools. Online bachelor’s degree programs include Criminal Justice, History, Homeland Security Studies, Liberal Studies, Nursing, Psychology, Sociology, and Business Administration. Sam Houston State University earned a ranking of #7 on a list of top 50 Online Registered Nurse (RN) to Bachelor of Science in Nursing (BSN) Programs in 2018 by BestCollegeReviews.com. The University of North Dakota offers 27 bachelor’s degree programs through distance learning that mirror in-person courses and requirements. This institution was accredited by the Institutional Actions Council of the Higher Learning Commission. Online majors include Chemical Engineering, Civil Engineering, Petroleum Engineering, Communication, Mechanical Engineering, Public Health, Computer Science, Cyber Security, Data Science, Early Childhood Education, Electrical Engineering, Psychology, Public Affairs, Social Work, General Studies, and Social Science. In 2012, UND ranked #11 on a list of the Top 12 Nonprofit Online Schools in the U.S. by Guide to Online Schools. The University of North Dakota ranks #69 on the U.S. News & World Report list of Best Online Bachelor’s Programs and #43 on the list of Best Online Bachelor’s Programs for Veterans. The University of Arkansas, a top public research university, offers cheap online degrees for students seeking a continuation to their education. It is accredited by the Higher Learning Commission. Students can pay in-state fees for tuition through most online degree programs at the University of Arkansas. Among the bachelor’s degrees available through distance learning are Communication, Interdisciplinary Studies, Accounting, General Business, Supply Chain Management, Human Resource and Workforce Development Education, and an RN (Registered Nurse) to BSN (B.S. in Nursing) program. This institution also provides certificates of proficiency in Child Advocacy Studies or Geospatial Technologies. In 2019, the U.S. News & World Report placed U of A’s online bachelor’s programs as #18 in the nation. U of A also ranks #13 in Best Online Bachelor’s Programs for Veterans. Oregon State University lets students choose from over 25 bachelor’s degrees online. This institution received its accreditation from the Northwest Commission on Colleges and Universities (NWCCU). Online programs include Economics, Environmental Economics and Policy, German, Natural Resources, Psychology, Fisheries and Wildlife Studies, Rangeland Science, Spanish, History, Anthropology, Business Administration, Women, Gender, and Sexuality Studies, and Sustainability. Undecided students can choose to enter the University Exploratory Studies Program through Oregon State University’s Ecampus to explore different majors. For five years in a row, Oregon State University’s online programs ranked in the top 10 among all online programs in the United States according to the U.S. News & World Report. Southeast Missouri State University crafted an online program to accommodate students with non-traditional schedules and lives. It was accredited by the North Central Association of Colleges and Schools and the National Council for the Accreditation of Teacher Education. Students can choose from several degree programs including, Applied Technology, Business Administration, Computer Information Systems, Criminal Justice, Family Studies, General Studies, Healthcare Administration, Interdisciplinary Studies, Nursing, Psychology, Social Science, and Technology Management. In 2019, it was ranked in the top 10 of a list of Best Value Online Schools in Missouri. The U.S. News & World Report places Southeast Missouri State University as #84 on a list of Best Online Bachelor’s Programs. It also places SMSU as #50 in Best Online Bachelor’s Programs for Veterans. Missouri State University – Springfield provides an affordable online college option to students through fully online degrees at lower costs than many other institutions. It received accreditation from the Higher Learning Commission. Students choose from bachelor’s degrees in Communication Studies, Criminal Justice, Finance, General Business, Health Services, Hospitality Leadership, Nursing (RN to BSN program), Professional Writing, and Psychology. Missouri State University is listed as the #5 Top Public University in Missouri on Niche. On the U.S. News & World Report, Missouri State University ranks #76 in Best Online Bachelor’s Programs and #47 in Best Online Bachelor’s Programs for Veterans. University of Alaska – Fairbanks provides an eCampus for students who require flexibility. This institution was accredited by the Northwest Commission on Colleges and Universities. Several bachelor’s degrees have online programs for non-traditional students. Students can receive an affordable online degree in Business Administration, Applied Management, Homeland Security and Emergency Management, Justice, Psychology, or Sport and Recreation Business. The University of Alaska – Fairbanks is listed as #194 on the U.S. News Best Colleges rankings. In 2018, it also appeared on a list of the 50 Best Nonprofit Colleges for Online Bachelor’s Degrees created by Nonprofit Colleges Online. Lee University is a Christ-centered liberal arts college, that offers many ministry-related programs. It was accredited by the Southern Association of Colleges and Schools Commission on Colleges. There are several, competitive bachelor’s degrees offered online at Lee University. These include Business Administration, Criminal Justice, Liberal Studies, Bible and Theology, Christian Studies, and Ministry Leadership. The U.S. News & World Report places Lee University at #42 in Best Online Bachelor’s Programs. In July 2017, Christian Universities Online awarded Lee University the title of most affordable Christian College in the nation. And the Adult Learning division at Lee University ranked in the top 150 of Best Online Bachelor’s Programs by the U.S. News. The University of Texas at the Permian Basin helps students access one of the cheapest online degrees in Texas. This university received accreditation from the Commission on Colleges of the Southern Association of Colleges and Schools. Students may enter bachelor’s degree programs in Accountancy, Child and Family Studies, Communication, Criminal Justice, Humanities, Industrial Technology, Management, Marketing, Nursing (RN to BSN program), Political Science, Psychology, and Sociology. Several of those programs also have an accelerated track option. The U.S. News and World Report ranks the University of Texas at the Permian Basin as #173 in Best Online Bachelor’s Programs and #86 in Best Online Bachelor’s Programs for Veterans. Affordable Colleges Online also ranked the University of Texas at the Permian Basin as one of the Most Affordable Online Colleges in 2016 and 2017. Minot State University provides students an option to go to an affordable online college away from its campus in North Dakota. It was accredited by the Higher Learning Commission. Bachelor’s programs offered at Minot State University include Criminal Justice, Management, International Business, Marketing, Applied Business Information Technology, Nursing, General Studies, and Human Services. The U.S. News & World Report places Minot State University at #248 on its ranking of Best Online Bachelor’s Programs. Minot State University is also listed as #3 in Best Colleges in North Dakota on Niche. Winston-Salem State University has the goal of reaching those students who have few opportunities to pursue further education in a traditional manner. This North Carolina institution was accredited by the Southern Association of Colleges and Schools Commission on Colleges. Two master’s programs are offered online by Winston-Salem State University, a Master of Science in Rehabilitation Counseling and a Master of Science in Nursing with an Advanced Nurse Educator (ANE) Concentration. Winston-Salem State University ranks #53 on the U.S. News & World Report’s list of Best Online Graduate Nursing Programs. Norwich University, located in Vermont, matches professionals wishing to advance in their careers and make a difference in their lives with online graduate education. It received accreditation from the New England Commission of Higher Education. Norwich University offers several master’s degree programs, including Diplomacy, Military History, History, Business Administration, Civil Engineering, Public Administration, Information Security & Assurance, Nursing, Leadership, International Relations, Criminal Justice, and Strategic Studies. The U.S. News & World Report named Norwich University as having some of the best online graduate programs. It ranked #46 in Best Online MBA Programs and #29 in Best Online Nursing Master’s Programs. The California University of Pennsylvania lets students earn degrees with the same rigor and faculty as those offered on campus. This institution was accredited by the Middle States Commission on Higher Education. The Global Online program created by the California University of Pennsylvania offer online master’s degrees in Administrative Program for Principles, Applied Mathematics, Arabic Language and Linguistics, Conflict Resolution, Criminal Justice Studies, Cybersecurity, Early Childhood Education, English as a Second Language, Exercise Science, and Legal Studies. Students may also enter several Masters of Business Administration programs, including Entrepreneurship, Business Analytics, Healthcare Management, and Nursing Administration. There are also several options for concentrations in Special Education and Sports Management master’s programs. The U.S. News & World Report ranks the California University of Pennsylvania as #37 in Best Online Graduate Criminal Justice Programs, #55 in Best Online Graduate Business Programs, #168 in Best Online MBA Programs, and #169 in Best Online Graduate Education Programs. Eastern Kentucky University Online gives students options to pursue higher education to make them eligible for leadership positions and managerial roles. This institution received accreditation from the Southern Association of Colleges and Schools. Eastern Kentucky University offers over 15 master’s degree options, including Elementary Education, Gifted Education, Industrial-Organizational Psychology, Instructional Leadership, Literacy, Public Administration, School Media Librarian, Special Education, and Rural Health Family Nurse Practitioner. In 2018, Eastern Kentucky University Online was ranked as one of the Best Online Colleges by BestColleges.com. The U.S. News & World Report also ranks it #27 in Best Online Graduate Nursing Programs and #89 in Best Online Graduate Education Programs. Champlain College is a cheap online college option for many students who need flexible programs. It was accredited by the New England Association of Schools and College, Inc. Many of the master’s programs can easily be completed in one year for those wishing to quickly advance their education. Champlain College also offers 6 start terms every year and 8-week classes to allow you to pursue your degree on your terms. Online master’s degree programs at Champlain College, include Accounting, Business Administration, Digital Forensic Science, Executive Leadership, Health Care Administration, Human Relations & Organization Development, and Information Security Operations. Champlain College was named by the U.S. News & World Report as the Most Innovative School in the North. Bellevue University has set up a unique online experience for distance learning, including small class sizes, online forums, excellent faculty. Its online programs have received accreditation from the Higher Learning Commission. Bellevue University offers a wide array of master’s programs available through distance learning. These include Business and Professional Communication, Accounting, Healthcare Administration, Project Management, Cybersecurity, Data Science, Clinical Counseling, Human Resource Strategic Management, Leadership and Coaching, Strategic Marketing, Organizational Performance, Professional Studies, and Business Analytics. The U.S. News & World Report ranks Bellevue University between #114 and #150 in Best Online Graduate Business Programs. Graceland University values quality education no matter if it is in-person or online. It was accredited by the Higher Learning Commission. Several master’s programs are offered through distance learning, which will help professionals advance their career goals forward. These online programs, include Literacy Instruction, Special Education, Instructional Leadership, Nursing, and Religion. The U.S. News & World Report ranks Graceland University as #126 in Best Online Graduate Nursing Programs. Benedictine University lets students earn a degree from a top-tier private university. This institution received its accreditation from the Higher Learning Commission and the North Central Association of Colleges and Schools (NCA). Online master’s programs at Benedictine University, include Business Administration, Public Health, Nursing, Management and Organizational Behavior, Nutrition and Wellness, and Accountancy. Benedictine University also offers several unique dual degree programs. These include Master of Science in Nursing/Master of Business Administration, Master of Business Administration/Master of Public Health, Master of Public Health/Master of Science in Management and Organizational Behavior, and Master of Business Administration/Master of Science in Management and Organizational Behavior. The Master of Public Health at Benedictine University was listed as one of the 50 Most Affordable Online M.P.H Programs in 2015. OnlineMasters.com also ranked the university’s Nursing and Marketing online programs among the best programs in the nation. Saint Leo University focuses on helping professionals prepare for the future, including personal goals and global challenges. This institution was accredited by the Southern Association of Colleges and Schools Commission on Colleges. Online master’s degree programs at Saint Leo University, include Accounting, Business, Creative Writing, Criminal Justice, Critical Incident Management, Cybersecurity, Education, Social Work, and Theology. Each of these master’s programs is driven by a student-centered mindset. The U.S. News & World Report ranks Saint Leo University’s MBA Programs as some of the best in the nation. National University has over 20 years of experience with online education, especially with a focus on adult learners with personal responsibilities. It received its accreditation from the Western Association of Schools and Colleges (WASC) and the International Assembly for Collegiate Business Education (IACBE). Over 35 master’s degree programs are offered completely online at National University, including some of the cheapest online degrees. These master’s programs, include Accountancy, Human Resource Management, Strategic Communication, Business Administration, Healthcare Administration, Digital Journalism, Film Studies, Gerontology, Human Behavior, Performance Psychology, English, Creative Writing, Special Education, Applied Behavioral Analysis, Health Informatics, Computer Science, Criminal Justice, and Forensic Sciences. The U.S. News & World Report lists National University as #52 in Best Online Graduate Criminal Justice Programs, #202 in Best Online MBA Programs, and #222 in Best Online Graduate Education Programs. American InterContinental University lets students choose what works best for them in their graduate education. As one of the cheapest online colleges in the United States, American InterContinental University offers grants to pay for education, allows students to transfer credits, and supports veteran students with tuition reductions. Online programs at AIU, include Masters of Business Administration in various specializations, including Accounting, Finance, Human Resource Management, Operations Management, Project Management, Technology Management. There are also several Masters of Education, with specializations in Elementary Education, Instructional Design and Technology, Leadership of Educational Organizations, and Secondary Education. Other online master’s degree programs in Healthcare Management and Information Technology are also offered. American InterContinental University received a great ranking in Best Online MBA Programs and Best Online Graduate Education Programs by the U.S. News & World Report. Baker College in Michigan offers a variety of quality master’s programs through one of the cheapest online colleges. It is accredited by the Higher Learning Commission. Master’s programs in Cloud Security Risk Management, Information Systems, Industrial/Organizational Psychology, Educational Leadership, Nursing Administration, and Nursing Education can be pursued online through Baker College. There are also several concentrations of Master of Business Administration, including Accounting, Finance, Business Intelligence, General Business, Healthcare Management, Human Resource Management, Leadership Studies, Management, Marketing, and Logistics. Baker College has earned a ranking on the U.S. News & World Report’s list of Best Nursing Schools. Colorado Technical University brings real-world experience into online classrooms through excellent professors and industry professionals. This institution gained accreditation from the Higher Learning Commission and the North Central Association of Colleges and Schools. Colorado Technical University offers several online master’s degree programs. These include Business and Management, Engineering and Computer Science, Healthcare, Information Technology, Nursing, Project Management, and Security Studies and Criminal Justice. The online program at Colorado Technical University offers a unique Fast Track option, where students may earn college credit through taking a series of exams testing knowledge of key course points. Baker College ranked high on the U.S. News & World Reports rankings of best online programs. It also ranked #42 in Best Online Graduate Criminal Justice Programs, #187 in Best Online MBA Programs, and #36 in Best Online Graduate Computer Information Technology Programs. New England College offers quality education through distance learning programs that do not sacrifice substance or educational benefits. A large selection of master’s degree programs is offered through online programs at New England College. These include degrees in Higher Education Administration, Human Resource Management, Professional Writing, and Public Policy. New England College also offers a range of Masters of Business Administration, including Digital Marketing, Health Informatics, Healthcare Management, Non-profit Leadership, Project Management, Sport and Recreation Management, Strategic Leadership, and Strategic Sales Management. Masters of Education are offered in a wide variety of specializations including, Alternative Education, Curriculum and Instruction, Digital and Media Literacy, Educational Leadership, Math Literacy, Language Arts Literacy, Special Education, STEM, and Storytelling. Several Master’s of Science online programs are also offered, including Accounting, Forensic Accounting, Healthcare Administration, and Real Estate Management. The U.S. News & World Report ranked New England College as #159 in Best Online Graduate Education Programs. Franklin University breaks students free from a choice between quality and value, with numerous online programs for non-traditional students. This institution offers accredited online master’s degree programs through Franklin University, including Accounting, Business Administration, Business Psychology, Computer Science, Healthcare Administration, Instructional Design, Public Administration, Marketing and Communication, Nursing, and Health Informatics. For increased flexibility, online classes are offered with various lengths, including 6-, 12-, and 15-week course choices. BestValueSchools.com ranked Franklin University as #2 on its list of Best Value Online Schools in Ohio for the year 2019. In 2017, Franklin University was ranked by TheBestSchools.org as #1 out of all online schools in Ohio.